Particularly in larger towns and cities, landlords and build-to-let management companies are increasingly dealing with a more transient tenant-customer base, many of whom are looking for ‘service-focused’ offerings and flexible tenancy agreements. With higher churn and concerns over cash flow, the demand for solutions that streamline the tenancy management process from start to finish is evidenced by the emergence of a number of PropTech companies operating in the space. Ripe for disruption is the tenancy deposit collection process. For many, paying what can be a substantial sum of money to secure rental accommodation is a major burden – particularly in London and the South East. At the same time, landlords simply want to ensure that they take on trustworthy tenants without having to spend a considerable amount of time and effort ensuring the correct boxes are ticked. In response, a number of insurance firms have moved into the rental space to underwrite the deposit costs for a premium – thereby removing the need to physically transfer funds. According to the sector, this simplifies the ‘onboarding’ / tenancy renewal process. Although tenant-customers incur higher net costs, they do not need to worry about hefty down payments and can build a track-record for themselves as financially responsible individuals that will look after the properties they let. As a consequence, they will be able to access more competitive insurance premiums down the line. Landlords also have access to a wider-pool of dependable tenant-customers, safe in the knowledge that any eventual tenancy surrender is less likely to be problematic. We spoke with Curran McKay, business development manager at Canopy – one of the UK’s leading rental deposit insurance providers – about how their business model operates. Please note that PS Investors Services / The Property Investor’s Blog is not endorsing this company and strongly encourage readers to engage in specific due diligence should they be approached by a tenant or lettings agent looking to use deposit insurance (instead of the traditional means). Why was it felt there was a need for a service like Canopy to come to the rental marketplace? Tahir Farooqui, our CEO, spent 16 years travelling internationally as a management consultant. Yet, every time he moved, the firm he worked for would have to stump up a hefty deposit and advanced rent simply due to him being a British citizen. From country-to-country, his LinkedIn or Facebook didn’t change and he started to question why he had to “start again” each and every time as a renter with no history. Similarly, his younger brother was paying thousands of pounds in tenancy deposits back in the UK. After spending time speaking with lettings agents, who have to register billions of pounds of these deposits arbitrarily every year, the idea for providing all renters with a digital history using a ‘RentPassport’ was born. Subsequently, the ‘DepositFree’ insurance model was also developed as means of that history to secure properties faster with the same level of protection. Can you run through how the underwriting process that governs access to Canopy’s RentPassport™ and DepositFree™ solution works? Any tenant in the UK can download the Canopy app or visit our website and, in under a minute, we carry out all of the referencing checks from previous address validation and date of birth to income verification and Right to Rent checks. This calculates a score out of 100, called a TrustScore. The tenant can then share their reference with any letting agent or landlord, helping them to stand out from the crowd by virtue of being pre-referenced. If they have a high enough TrustScore, they will also qualify for DepositFree insurance which is exactly what it says on the tin: a like-for-like replacement of a standard tenancy deposit covering exactly the same amount, for exactly the same things (including rent arrears, damages, cleaning costs and more). Note that this entire process is undertaken by our investor partners Experian. Would a prospective tenant with some form of adverse credit history be automatically excluded from having a RentPassport™ and using the DepositFree™ solution? Any renter can create a RentPassport at no cost. The lettings agent would be able to see if there is adverse credit history, such as a County Court Judgment (CCJ), and make their own call on whether to grant a tenancy. However, it is worth noting that there are different degrees of impairment. A four-year-old unpaid parking ticket isn’t the same as defaulting on a £10,000 loan, for example. With DepositFree, a renter’s Experian credit score has a strong influence on their premium cost. However, a poor history may mean the app will automatically block out the insurance and they would have to pay a traditional cash deposit. Nonetheless, with our costless and frictionless RentTrack feature, tenants can record, reconcile and report their monthly rental payments to Experian. This will help them prove their creditworthiness and eventually provide access to rental insurance products (see below). Would private tenants claiming Local Housing Allowance (LHA) be able to use this service? Yes – Canopy verifies income but does not discriminate on the source. The important thing is whether a renter can afford the property – taking into account their income, existing outgoings, levels of debt etc. With regards to the insurance premiums, could you explain what “real-time micro-pricing” is? The premium, including the maximum amount of deposit replacement cover a renter can qualify for, is dynamically calculated in the app. With good previous financial history, it could cost up to 95% less than the upfront cost of a six-week deposit. These premiums can go as high as 15% before the option becomes inaccessible. Like most other insurance products, renters will be entitled to a ‘no claims’ bonus, lower premiums and rewards for treating the property with care and paying rent on time. Does the deposit get placed with Deposit Protection Service, MyDeposits or the Tenancy Deposit Scheme? How is it assured that a landlord’s legal obligations with regards to placing a deposit with these government-backed schemes are adhered to? At the current time, we currently hold the deposit in a secure wallet. These funds are transferred across to the agent for them to register with the scheme of their choice, whether custodial or insured. We have very exciting plans to perform a direct registration of the deposit with one of the leading schemes (although I cannot comment much more at this stage, unfortunately). Can you clarify how tenants that pay on time and do not create headaches for landlords are rewarded through the Canopy platform? As mentioned above, paying rent on time is reported to Experian and added to a tenant’s credit report. Payment history is also available in the app. This allows tenants to prove to a future letting agent, or indeed a bank, that they are eligible to rent a property and/or have ability to make large consistent monthly payments. We also have some further integrations that allow tenants to access credit cards, loans and additional services through our app (using their solid track-record to access better financial products). Of course, DepositFree insurance already allows tenants to keep more of their cash when moving. Provided they follow their Assured Shorthold Tenancy (AST) obligations properly, their TrustScore will continually improve. It also helps lettings agents stand out from the crowd and let their properties faster. Traditionally, timely rental payments would not count towards one’s credit score – it would be interesting to hear how Canopy’s software (and partnership with Experian) is changing this. This is one of the most disruptive and pioneering developments to ever hit the UK rental industry. Currently, there is no central database anywhere of an individual tenant’s rental payments. This means that letting agents rely on outdated models, such previous landlords references, to second guess whether someone will be a ‘good’ tenant. Our rent tracking solution has been built in partnership with Experian. At no cost to the renter or agent, and without any additional work being necessary, rent payment notes will be added to their credit file. The history is also recorded in the app. With the renter’s consent, the data can be shared with anyone and prove his/her ability to secure properties and, potentially, to be pre-approved for mortgages and other forms of secured finance. Canopy was one of the winner’s of the HM Treasury Rent Recognition Challenge, where we were acknowledged for the lead we’ve taken in this area. We have also established a working group to design a national framework surrounding how this data should be used to benefit renters across the UK. We have been involving credit bureaus, letting agents and other industry bodies such as Shelter and The Big Issue. We’re driving enormous change and pleased to be part of it. How does the process work if there is a dispute with returning the deposit at the end of the tenancy (from either the tenant’s or landlord’s perspective)? The disputes system currently in place works well and has been developed using technology that ensures a smooth process for all parties involved in the rental transaction process. In the majority of cases where there is no claim on the insurance, an agent can simply return the deposit at a click of a button with no hassle. In the event of an agreed claim, Hiscox will pay out within ten working days. Where a tenant disputes the claim, the case goes to arbitration and both parties will be asked to submit supporting evidence in the form of a comprehensive inventory, check-out report, photographs etc. Any payouts are then assessed and made to the agent or, if the tenant’s claim is upheld, the claim amount is revised. What if the tenant feels he/she has been unfairly treated by the landlord, financially or otherwise? Currently, tenants have little recourse to address this issue but we will soon be adding features to the app that allow us to record communication between all the parties. For example, we would be able to view how quickly issues such as repairs, boiler fixes and noise complaints are being dealt with. We believe that clarity and maintaining a strong, valid history of both landlord and tenant is vital to ensuring everyone in the rental ecosystem is treated fairly. How is your model integrated into the fast-growing build to rent industry? 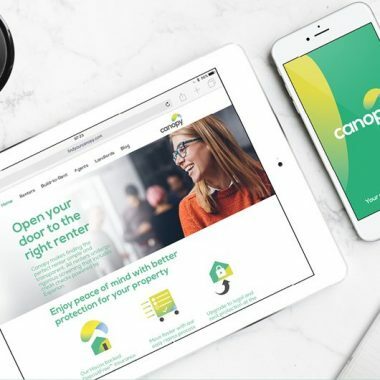 Canopy is an ideal partner for the burgeoning build to rent sector, who are pioneering a new form of service desperately needed in this industry. The attitude to renters – or residents as they are increasingly being referred to – is refreshing and very much based on trust and good service levels. We work with the leading names including Atlas Residential, Tipi and, our largest client, Get Living who have recently pioneered a new form of operating by returning millions of pounds of deposits by asking residents to create a RentPassport through Canopy. Across this emerging sector, providers increasingly pay for the insurance costs – meaning tenants only have to pay their first month’s rent whenever they move.